Hoyas all have a similar flower - a five-pointed star. Some plants seem to inspire a passionate following, with enthusiasts collecting as many of the varieties as they can. For hoya enthusiasts, this is a huge challenge - there are well over 200 species plus numerous cultivars. Hoya is a diverse genus. Most grow as twining climbers, although some are quite woody shrubs, and some are a bit of both. 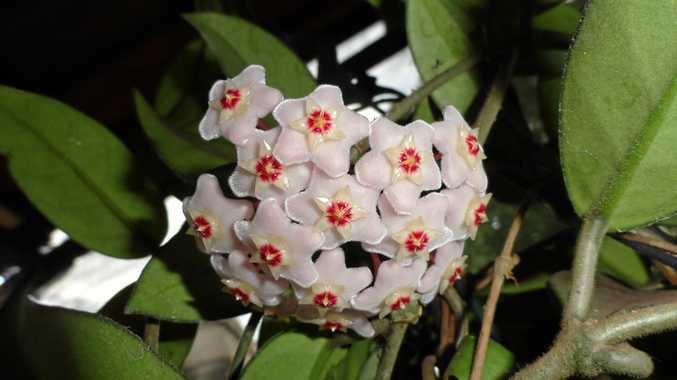 The most common form, hoya carnosa, is a climber known as 'wax flower' because the foliage and flowers have a stiff, waxy quality. Hoyas vary vastly but all have a similar flower - a simple five-pointed star. These may be tiny or up to 4cm across and held singly or in clusters of up to 70 blooms. Colours range from white through pinks, creams, yellows, greens and even browns. Some are incredibly showy and others are so nondescript that it's easy to miss them completely. Most are quite fragrant, especially in the evening. Leaves may be large or small, smooth or hairy, plain green or variegated, depending on the variety. There's a beautiful form with a perfect heart-shaped leaf (hoya kerrii), and another with long, twisted leaves called Indian Rope Hoya (hoya compacta, or sometimes hoya carnosa compacta). These plants are widespread, occurring in India, through Asia and the Pacific Islands and into northern Australia. They share a preference for bright, filtered light, fairly high humidity and not too much water. They are long-lived and I love them because they like to be fairly tight in their pots, which means they don't need frequent re-potting. Because most of the varieties we non-specialists grow are climbers, they are well suited to hanging baskets. They will even grow inside in a really bright spot. These plants have very minimal requirements. Potted specimens will appreciate a liquid feed every few weeks in growing season or slow-release fertiliser in spring. They don't need much watering, especially in winter, and they don't need lots of pruning. Flowers form on the same leaf spurs each year, so if you prune you may get fewer flowers for a few years as the plant grows some more spurs. If you happen to be a bit of a neglectful or time-poor gardener, this is definitely a plant you should add to your collection.